Hallelujah! The producers of Follies announced that they extending the run for a few weeks until January 22, 2011. 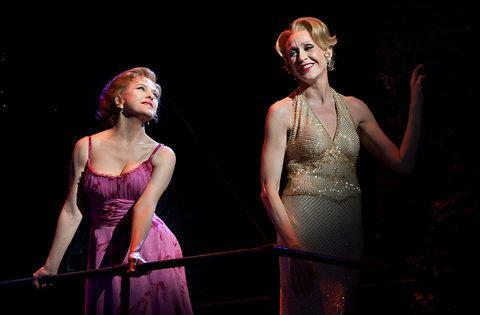 ﻿﻿This photo of Bernadette Peters as Sally and Jan Maxwell as Phyllis made me think of another Sondheim favorite - Anyone Can Whistle and the my much beloved song "There's Always a Woman." Unfortunately, in the recent City Center Encores! production of Anyone Can Whistle, this song didn't make the cut - it's not even on the original cast album of with Angela Lansbury and Lee Remick. Fortunately, it is on the concert album with Bernadette Peters and the late great Madeline Kahn. The only time I've heard it live was by Jan Maxwell and Victoria Clark at Opening Doors, the Sondheim revue at Zankel Hall in 2004 - the performance that sealed the deal for me that Jan Maxwell is one of the greats. I see "Sally" as "Fay" and "Phyllis" as "Cora." Sally and Phyllis have a history of course - castmates in the Weisman Follies, roommates in a little walkup apartment on the east side, and doubledates with Ben and Buddy. Time has passed, memories are misty and it's not all fun and games now. There's nothing as low as a woman. There's nothing so slow as a woman. The pain in the neck. The gum on the shoe. It must be the lighting. Whatever it is, it's a woman. It's quick and it's quiet. At least I could try it. She won't make a sound. As long as it's ground.